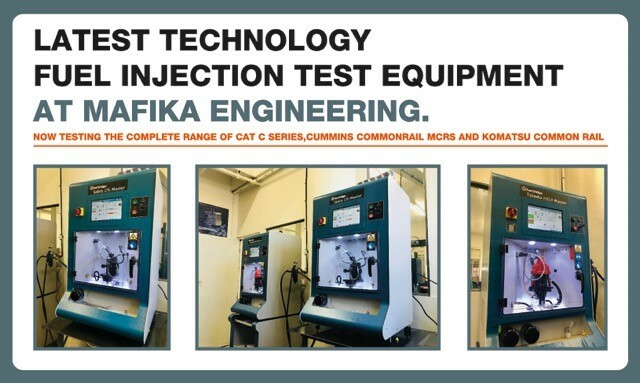 Mafika Engineering’s roots are in Motor and Diesel Engineering Works which was established in 1947, providing us with a 70 years worth of experience in the remanufacture, machining, assembly and dyna testing of diesel engines. Mafika has been a Bosch Approved Fuel Injection Pump Room for over 40 years. 3200 m² of factory consisting of a machine shop, assembly bay's,Fuel injection and four dynamometers testing up to 1,500hp. 2750m² of Heavy Duty Diesel Engine Assembly with two dynamometer test rooms remanufacturing up to 3,500hp. Mafika presently employs in excess of 50 people and we pride ourselves in having some of the best technical minds and hands in the business. Our staff are highly experienced in the field of automotive remanufacture and engineering. We utilise our vast experience to source components from around the world. Mafika Engineering is an accredited BBBEEE contributor who subscribes to the ongoing economic transformation of South Africa. Mafika’s BEE shareholders are actively involved in the day-to-day management of the company. We are very proud of our skills transfer and training programs for our employees. We have a MERSETA approved apprenticeship program with a particular emphasis on training of previously disadvantaged individuals. The program has been in operation for more than 10 years and boasts great success where many apprentices have graduated the program as qualified journeyman, artisans and technicians. In addition, we have a procurement policy in which the company promotes, develops and supports local businesses and services from previously disadvantaged communities while ensuring ethical, moral values and sound business practices during the company’s commercial activities.